Smith Real Estate & Contents Auction — Harritt Group, Inc. Spacious home on .7076 acre plus 2 prime building lots in established Wolfe Trace located off Graybrook Lane just South of Daisy Lane offered individually and in combinations using the multi-par method. Also selling entire contents of home including furniture, antiques, collectibles and household. One-owner custom built 2108 square foot brick ranch plus full unfinished basement, 3-car garage and 2 utility sheds on .7076 acre lot located near shopping and health care. Spacious home built in 1994 features 3 bedrooms, 2 baths, family room with gas stone fireplace and beamed cathedral ceiling, living room, equipped eat-in kitchen and formal dining, large walk-in closets, tile floors, mud laundry room on first floor, covered porch, covered patio and rear entry garage. 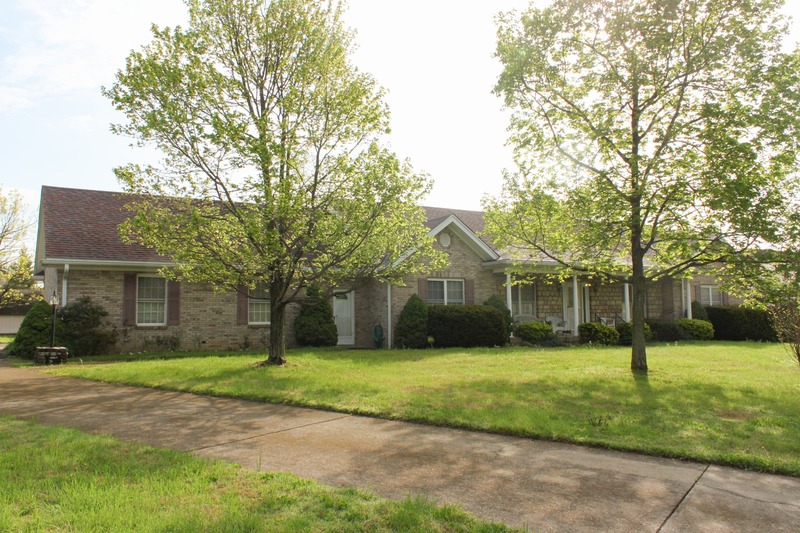 Home located on Lots 10 & 11 in established Wolfe Trace located just minutes to I-265. Vacant .33 Acre restricted building lot known as Lot 9 with 73’ frontage located adjacent to 81 Wolfe Trace. Vacant .76 Acre restricted building lot with 211’ frontage located adjacent to 79 Wolfe Trace. Land consists of Lot 8 .3246 Acre Wolfe Trace plus adjacent unplatted .437 Acre off Lynn Road. 10% non refundable down payment day of auction, balance due in 40 days. Taxes prorated to day of closing. Possession immediate upon closing. Oak pedestal dining table and chairs, maple china hutch, maple drop leaf table, maple server, (2) maple deacon benches, secretary desk with book case, rolling kitchen island with butcher block top, curio cabinet, full size maple bedroom suite with bed, dressers and nightstands, end tables, sofas, recliner, chairs, futon, book shelf, armoire and an electric oregon. (2) Mantle clocks, (2) wall clocks, anniversary clock, glass insulators, ornate electrified oil lamps, art pottery, retro bouncing horse, hurricane oil lamps, several decorative vases, crackle glass, multiple cups and saucer sets, dolls, figurines, ornate silverplate serving dishes, china dishes, Jim Beam decanters, large selection of sewing supplies, decorative framed art, glassware, small kitchen appliances, Schwinn bike, hand and yard tools, kitchenware, linens, lamps and contents of basement, garage and (2) storage sheds. Grant Line Road or State Street to Daisy Lane to Graybrook Lane to right on Wolfe Trace. Auction on right.